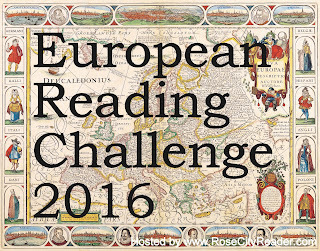 Rose City Reader: FINALLY -- The 2016 European Reading Challenge WINNER! FINALLY -- The 2016 European Reading Challenge WINNER! 2016 was the fifth year for this challenge, which involves reading books set in different European countries or written by authors from different European countries. In a real celebration of European Reading, the Jet Setter Prize for 2016 goes to "Eginhard" who read and reviewed 14 books from different countries, mostly in their original languages! He even read a book in Irish and one in Serbocroatian. I usually feel all fancy pants when I read a book that was translated from another language and not just set in a foreign country. Congratulations, Eginhard! And I am glad you signed up again for 2017! Honorary Mention (but no prizes) go to eight other participants who posted wrap up posts on the Wrap Up page because I appreciate these posts very much for making my job of figuring out the winner so much easier! My own wrap-up post is here. I read 10 books from different European countries (all in English), but I only reviewed one of them.